A busy few weeks for sure - so much so that I have been quite lax in finishing up my Xinjiang notes from the May Day holiday. An old oasis on the Silk Road, Turpan lived up to its reputation for heat, dust, melons and grapes. The roads into town were lined with chartreuse grape vines contrasting with the dry sienna earth. We had decided to make the most of our time in Turpan and rented bikes the night before, fine specimens of mechanical prowess sporting solid brake lines, massive wobbly tires and beach-cruiser bent handle bars. We had our sights set on a 10 km ride out of Turpan to Jiaohe, the ruins of an ancient city set on a high plateau in the branch of a river. The nearly 30 meter cliffs of the plateau provided natural protection for the city. Waking at 6AM, an ungodly hour on vacation, we were both relieved and bothered to find the sun had yet to rise. After dozing for another hour we rubbed the sand out of our eyes and hopped on our bikes. Even on Xinjiang time, the sun at 7AM beat down as merchants set up their carts along each street, selling a variety of grapes and baked naan. Outside of the towns downtown heart the tallest buildings were two-story raisin drying towers. Usually set on top of a family dwelling, the tops were built with a alternating brick pattern, allowing for a lattice-work that welcomed in the dry desert wind. 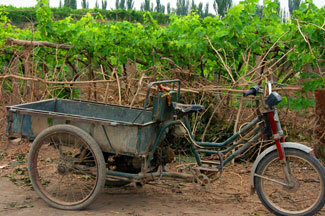 Grape farmers were already up and among their vines pruning away. After pedaling through vast fields of grapes and idyllic countryside we cut down through a small valley we came to… a large parking lot. Typical. Even minor Chinese tourist attractions couldn’t resist “upgrading,” complete with trinket shops, photo opportunities and a large front gate. To top it off we had arrived an hour before the gates opened - no wonder the parking lot was lacking huge tourist buses. Locking our metal contraptions near the gate we wandered off behind the low walls that enclosed the tourist area to see what we could find. Walking up and out of the small tree-filled valley we passed farms full of goats and small houses with freshly swept dirt walkways. A few grape-drying towers at the crest of the hill watched out over the rocky desert stretching out and towards the mountains west of Jiaohe, the last evidence of life before rolling dunes of sand and stone. Barely visible was a small footpath winding its way out into this expanse. In what I can only describe as a Martian landscape of burnt dust and small hills I imagined standing somewhere as foreign as Mars. I half expected the tiny wheeled Mars Rover to come trundling over the next rise. We had walked for only 10 or 15 minutes through this landscape when - seemingly out of nowhere - green. An intense carpet of green flowing through the tan desert. The feelings of coming upon this after being in the desert for weeks must have been rapturous. I had only been walking for 15 minutes and my reaction was physical - one of surprise and discovery. To complete the scene, in the middle of this river of green, was a lone horse tethered next to a small wet patch, obviously quite interested in the two interlopers. The green river itself was nestled between two steep water-carved canyon walls and the damp ground covered with a short wiry grass, recently grazed. For as far as we could see it was the three of us - Scott, myself and the horse - all basking in the green of the canyon. We skipped it, wanting to keep the oasis we found rather than ice cream vendors and fake dioramas fresh in our minds. Sometimes things work out better than you expect.